I’m originally from New Jersey and grew up eating a lot of black mussels. So when I found these New Zealand mussels I thought, these would make delicious Mussels Oreganata. First, I need to clip a few fresh herbs from my Hanging Herb Garden. This recipe is very easy to make. Mussels Oreganata are a great appetizer to serve before a pasta dish. First, place the mussels in a sink of cold water. Scrub with a stiff brush to remove any barnacles that may be attached to the outside of the mussel. Grasp the beard, the fibrous clump, and pull out swiftly towards the hinge end. Rinse and place in a bowl, ready to cook. In a 6-quart stockpot, on high heat add 3 smashed garlic cloves and 3 1/2 cups of Chardonnay. Bring to a boil. Next, add the mussels and cover. Steam for about 3-4 minutes, or until they’ve all opened. Using a spider (a large slotted ladle) discard any unopened mussels. Remove the cooked mussels from their shells, reserving 24 half shells. Arrange the half- shells in a single layer (12 on each pan) on 2-1/4 rimmed baking sheet pans, lined with foil. Place the cooked mussel in each shell. In a large bowl, toss together the breadcrumbs, oil, oregano, mint, basil, parsley, grated garlic, minced shallot, Kosher salt, and pepper. 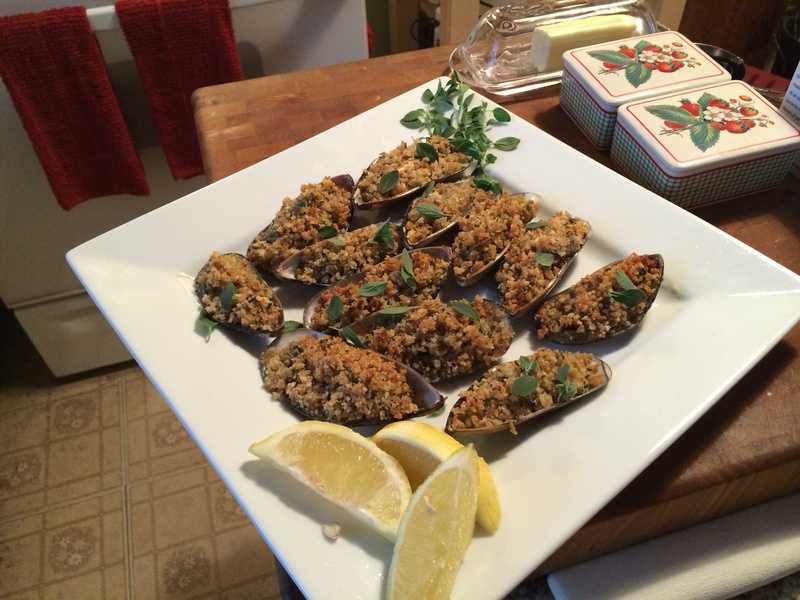 Top the each of the mussels with breadcrumb mixture and drizzle with E.V.O.O. Broil until the breading is golden brown, 2-3 minutes. To Serve: Place 4 Mussels Oreganata on each serving plate. Garnish with lemon wedges and a sprig of fresh oregano.